Welcome to the BlueBell Golf Society (1973) m/c website. 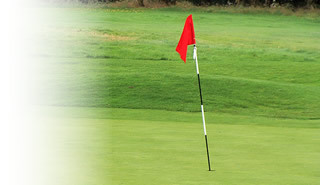 The BlueBell society is one of the longest existing golf societies in the Manchester area. It was formed way back in 1973 at the BlueBell public house in Moston, Manchester. Some of the founding members are still active in the society and its through their efforts that it enjoys continued success today. The original membership was restricted in numbers and therefore membership became coveted and joining was a case of filling "dead mans shoes". Nowadays the BlueBell is based at Blackley Golf Club,Manchester,the membership is strong with around 40 playing members who maintain the original values of the gentlemens game,playing at various courses round the country,culminating in the End of Season Tour (not so gentlemanly) which this year visits South West Scotland based at Dumfries. One of the main aims of the society is raising funds for local charities. The serving Captain will nominate his designated charity at the AGM and throughout the year funds are raised in support. Over the years many thousands of pounds have been raised for a variety of great and deserving causes. This year our captain Mr Kevin Baron, has chosen to raise funds for the National Deaf Children's Society. We hope our members enjoy their golf and look forward to their continued support in making this year another success. 25/05/2018 Accrington & District G.C. Cliff Barrett. Alex Reynolds. Gerard Skelly Darren Hoolickin / Garry Baldwin Gerard Skelly. 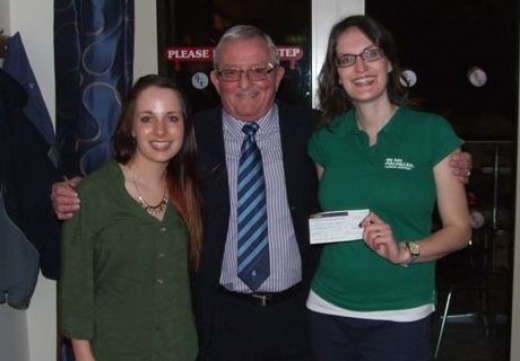 Captain Barry handing over cheque to MacMillan Reps Gemma and Becky for £2000. Thanks for everyone's support. © BlueBell Golf Society (1973) m/c 2011.